I am Guest Designing with Tiddly Inks today!!! Here is my creation for the new weekly challenge~Anything Goes! For this challenge, I used Bad Medicine. I used my Copic markers to color in this cutie. The paper comes from a 6x6 paper pad from American Crafts that I purchased at Target. The sentiment accompanies the digital stamp and it reads: Wrapping you with my love! Feel better soon! This image was so fun to color! 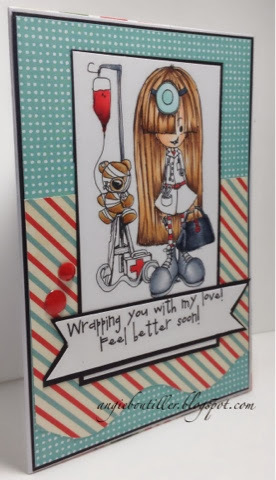 Fortunately, I don't have a need for a lot of get well cards but this is perfect for just those cards! Click here to check out the DT creations and then it is your turn to link up a new creation for the Anything Goes challenge! Thank you for stopping by...Happy Tuesday! 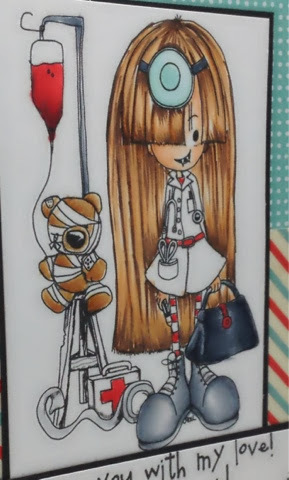 AAAAAWESOME "get well soon" card!! This will sheer somebody up!! Love it!! Sooo...because of you, I now have a few Tiddly Inks images...sigh! My name is Ann...I am a digi-holic!